Saturday, July 19th, was an exciting day for fifty children from the area as they prepared for the start of a new school year. We had many Rotarians along with their families and friends help make this event a success. Fort Yuma Rotary contributed $2,500 and Mervyn's matched our contribution with $2,500 plus Mervyn's gave an additional discount for purchases that day. Louie Galaviz worked with various agencies (Boys and Girls Club, Salvation Army, Somerton Club, Amberly's Place, Crossroads Mission, Child and Family Services, Arizona Childrens Assn. and a local Church) to provide the children. 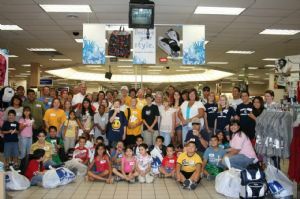 After shopping, the children were transported to the Boys & Girls Club for breakfast, dental check-ups, haircuts and eye exams. Thank you to Kool Smiles, Cost Cutters and Sam's Optical for providing their services.